Married and getting CDL to join hubby. I love old breed dogs....before they started breeding the brains out of them. YOU DID IT DEB !!!!!!!! We knew you could...you knew you could...and now EVERYONE knows you can !!!! Now to get your trainer time going, and start seein' some different sights !!! Keep us posted when you can !!! I agree about the Fur Kids.....I couldn't drive truck with out 'em. Well said, Tracey......alot of men like the trucking life, cuz THEY like THEIR independence....but when they finally come home and find an independent little wifey....Oh Hell No !! yeah...I agree....you gotta do what you gotta do..whichever way the wind blows. And for the record, TSB (my other half) does cook, will help with all the house work...and runs a mean vacuum !!! But he also likes his independent wife...who has, in the past, left him at home, and taken the truck out for weeks at a time by herself !! Now he's a lucky man...he has a woman who can DO IT ALL !!!! Can I interview you to find out if this is the job for me? GREAT ANSWER AND INFORMATION C.S. !!! Every company has different rules...But across the board one rule applies to all. If ANY trainer makes sexual advances, innuendos, threats, or sexual blackmail towards you....you CALL the safety department of your company asap. You deserve to be treated with respect, period. I teamed with my hubby for alot of years. Its a great way ot do the tourist thing, enjoy things together (including the shower!!) and get paid for it. But I will say this.....if a marriage can withstand team driving with a closet for a home...it can withstand anything !!!! I haven't heard how the new physicals are done....so if someone takes one....give up a heads up !!! Yup...the fine ladies who posted before me have said it all.....It doesn't take outside plumbing to drive a truck. For women, it takes tenacity, a full sense of self worth, and knowing that the "pair" that we have is bigger than any guys junk....( dang, I like how I said that ). You will be tried everyday...You will have to demand respect from other drivers, shippers, receivers, and possibly your boss. But you will need to know yourself well enough to know when you are hitting the glass ceiling. Then its time to move on. Get your cdl, a year of solid OTR experience, and you can go to, and do anything that your heart desires, or peeks your interest. 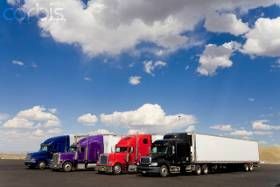 There are ladies in every vein of trucking...right up to owner operators ( which I would not suggest in this economy). So step out there and follow that dream....grab that adventure and run with it....follow that white line down that asphalt ribbon... And Welcome to TT !!! and ........keep us posted !!! Well...it took a new computer...but I'm back !! I would have to say, that you would do well to be more aware of your surroundings....There are people who would knock you in the head for whats in that truck. Pharmaceuticals sell better than well on the black market. You know the drill, I won't bore you with repetition ....stay safe. I got my cdl!! Now what??! Trucking is not a job....It is a LIFE STYLE.......That being said...you can expect to be out approx. 6 weeks at a turn...If you can't deal with that, then you have gotten into the wrong field. But...get all the training you can....and go ahead and apply with those local companies !!!! You never know when you will find a soft heart who understands special needs kids, and momma's who love them, but also need to make a living !!! So what if they have an amount of experience they want...when they need a driver, they NEED a driver.....take the chance.....try the dance...you may like the tune !! Yup...My hubby and I teamed as Owner Operators for over 15 years....It was great to see all the wonderful country with your partner. If your marriage can weather driving team.....its bullet proof !! CONGRATULATIONS !!!!! Now you can get out there and start your adventure !!! Keep us posted ! !